The ceiling, sometimes referred to as the fifth wall, is often the most neglected design space in the home. But, with a few simple touches, you can transform that dull ceiling into a focal point. There are a number of ways to spruce up your ceiling. 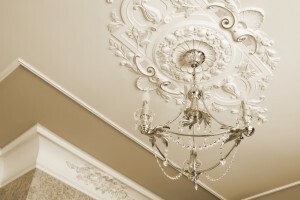 Popular ceiling projects include ceiling tiles, medallions, a coffered ceiling, and crown molding. Cover a plain whit e ceiling with a decorative ceiling tile and it instantly becomes an eye-catching feature. 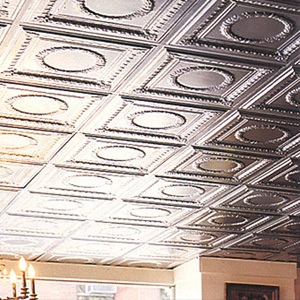 Tin ceiling tiles give a vintage appeal. Van Dyke’s Restorers offers Shanker Original Design Ceiling Tiles in an array of styles. Designs include squares, diamonds, circles, flowers, leaves, wreaths, and scrolls. Polyurethane ceiling tiles are another option. These lightweight tiles come in a wide variety of patterns and styles modeled after historic patterns. Urethane can be painted or faux finished and is easy to install with glue or screws. 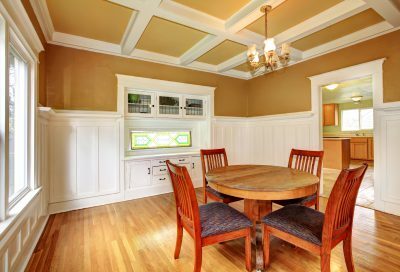 Another popular ceiling option is the coffered or drop ceiling. A coffered (box) ceiling is made up of box-like panels suspended from a grid to add depth and architectural interest. A coffered ceiling can also be made up of beams that connect with intersection pieces to create unique designs. Coffered ceilings add visual interest to taller ceilings. Van Dyke’s now offers a selection of components for constructing this beautiful ceiling. Decorative ceiling medallions create a pretty design element in any room and are a great way to accent a chandelier or other light fixture. Medallions are available in decorative wood or lightweight polyurethane or other plastic resins. Polyurethane is easy to mount with construction glue and screws and is less costly than wood medallions. Polyurethane also will not rot, warp or split and is impervious to insects. Choose from a wide selection of sizes, shapes and designs to create any desired look. Medallions range in size from 4-inches to 72-inches and designs are available from the simplest pattern to more elaborate Victorian styles to contemporary designs. The crowning touch to any ceiling makeover is crown molding. Corners are traditionally cut on an angle using a miter box or coping saw. Crown molding can also be used with a corner block adding a vintage look and eliminating the need for making tedious miter cuts. Inside and outside cornerscome in many shapes and sizes. In addition to traditional wood and plaster crown molding, this versatile molding is also offered in a high-density polyurethane product. 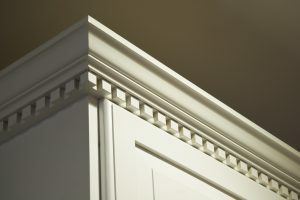 Van Dyke’s Restorers has a great selection of polyurethane crown molding in many patterns and widths to complement any style room.